Video screenshot of acting Director-General of the Government Communication and Information System, Phumla Williams at the Zondo Commission of Inquiry. 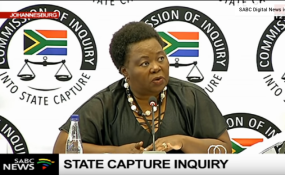 Cape Town — Phumla Williams' testimony at the Zondo Commission of Inquiry continues. This comes after the acting Director-General of the Government Communication and Information System (GCIS) said that Mzwanele Manyi sent her a text message during her previous appearance while she was presenting evidence which implicated the former CEO, alleging that he irregularly changed the tender process at GCIS. During her latest appearance before the commission, Williams spoke of her "strained" relationship with Faith Muthambi. Williams compared the former communications minister's tenure at GCIS to apartheid torture. "I think Minister Muthambi, or rather this woman, I'm really being sorry to say what I want to say, Minister Muthambi had ripped my scars of (apartheid) torture... completely, completely ... I had panic attacks, I saw torture going through my body again. I never thought in this government, people can do such things. I was tortured for weeks, and Muthambi did the same thing to my body," Williams said. She stated that she did not consult a doctor on her condition, instead opting to take early retirement. Williams reversed this decision, believing it was a betrayal to her country and her children. The topic of Themba Maseko's removal was broached by Advocate Hofmeyer who asked Williams to clarify the date of the former CEO's dismissal from GCIS. Justice Zondo questioned Hofmeyer on this line of questioning to which the Advocate responded that it would show how state capture occured following Maseko's removal from GCIS. After this, Williams stated that she was never paid her allowance for acting as cabinet spokesperson despite a ruling by the Public Service Commission. Justice Zondo was shocked to find that the position of Director General and cabinet spokesperson had been vacant for 6 years, according to Williams' testimony, and asked how the positions could remain vacant for so long. Williams added that during 2016 she was still acting cabinet spokesperson but no longer acting director general, saying the position was held by Donald Liphoko who was apparently head-hunted by Mzwanele Manyi. Williams was placed back in the acting DG role in April 2017.